Home � Disney Vacation Club , Disney World Annual Passholder , Disney World Ticket Prices , Disney World Tickets , Disney World Vacation Planning , Recent � Is The Disney World Annual Pass A Good Deal? Is The Disney World Annual Pass A Good Deal? When you are planning your Disney World Vacation, two of the key questions that come to mind are What kind of tickets should I buy? and Should I consider a Disney World Annual Pass? We'll take a close look at the costs involved and the advantages of having a Disney World Annual Pass to help you make the choice that is right for you! 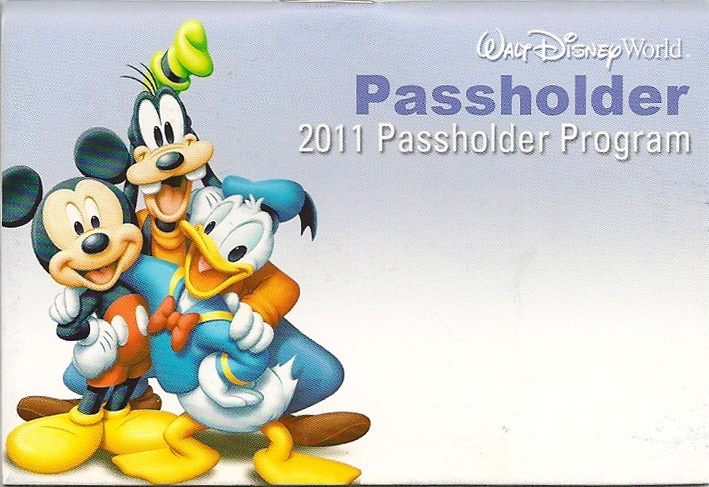 There are a number of benefits for Disney World Annual Passholders, but before we focus on those, it has to make financial sense to purchase an Disney World Annual Pass instead of the Magic Your Way (MYW) Tickets. Justify your purchase based on the costs involved and then the additional benefits for being an Annual Passholder will be just that: Additional Benefits. 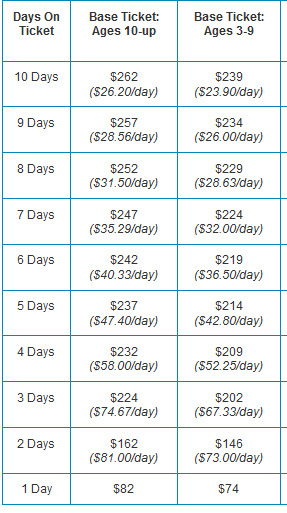 The 2011 Disney World Annual Pass does not come cheaply. With yearly price increases, it now costs $499 + tax for an Adult (ages 1-+) Annual Pass and $450 + tax for a Child ( ages 3-9) Annual Pass. 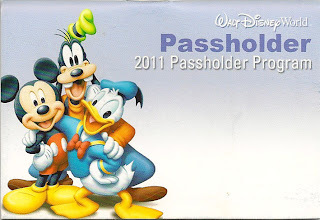 The Annual Pass entitles the user to visit the 4 Disney World Theme Parks (Magic Kingdom, Epcot, Disney's Hollywood Studios, and Disney's Animal Kingdom) for an unlimited number of times for the duration of one year from the date of activiation of the pass. Multiple parks can be visited on the same day if desired. Disney Vacation Club Members receive a special discount of $100 off of the standard cost Disney World Annual Pass. This results in a cost of $399 + tax. The DVC discounted rate for the Premium Annual Pass costs $504 + tax. The "normal" Disney World Park Tickets are called Magic Your Way Tickets due to the fact that they are flexible in terms of how many days worth of park admission you would like to purchase. This flexibility allows you to match the ticket duration to that of your specific vacation. While you don't have to purchase days that you don't need, you will quickly see from the table posted above the pricing structure greatly favors tickets that include 4 or more days. These tickets will allow you to visit one Disney World Theme Park (Magic Kingdom, Epcot, Disney's Hollywood Studios, or Disney's Animal Kingdom) each day with re-entry privileges for that day. The ticket expires 14 days after initial use. 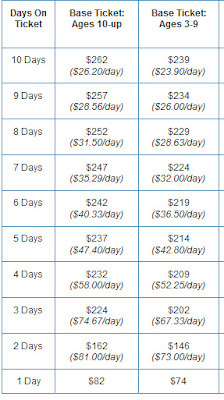 The Break Even Point when considering whether or not to purchase the Annual Pass is 2 week long trips to Disney World. At this point the costs are nearly identical and you receive the added benefits of the Annual Pass. The downside is if you cancel your 2nd trip and do not return to Disney World within that one year time frame then you spent double the amount on tickets, and nobody wants to do that. Even with the discounted Disney Vacation Club Rate, you still need to have a minimum of 2 trips planned during the year to get past the break even point. In order to make the upfront expense of purchasing Disney World Annual Passes worthwhile you should plan out your next year of Disney World Vacations. If you have the flexibility to plan your vacations for slightly different times each year, you can achieve the greatest benefit from the pass. For example: If your family likes to take its big annual vacation in June each year schedule the first year's trip one week later than you normally would travel (perhaps June 18-25 for 2011) and then the following year plan your trip for June 10 - 17. This would allow both June trips to occur on the same Annual Pass. If you decide later that you would like to visit the Food & Wine Festival for a long weekend or spend a quick few days to see the Christmas decorations at Disney World, you can do so rather inexpensively because your Disney World Park Tickets are already paid for. After your Annual Pass expires you can wait until the following June and start the cycle again. This keeps your total ticket expenditure approximately the same as a once a year visit cost, but gives you the flexibility to attend at other times of the year if you are so inclined. From personal experience this has been the biggest benefit of being a Disney World Annual Passholder. Purchasing park tickets for a long weekend costs almost as much an entire week, so you are discouraged to do so, but if you have an Annual Pass then you have the freedom to make that extra short trip to visit one of those Disney World Special Events. Entry to all 4 Disney World Theme Parks for one year. Free Parking at all 4 Disney World Theme Parks. Merchandise Discounts of 10% or higher at many Disney World shops. Occasional Disney Annual Passholder Special Events. Planning at least 2 trips within a one year period to Disney World with confidence that you will not cancel or delay the 2nd trip. Use the Park Hopping Option as part of normal Disney World Vacation. Planning is the key. If you normally visit at least once per year and can do the planning trick to take a 2nd vacation just before the one year expiration date, then anything extra is a bonus and you should definitely consider becoming a Disney World Annual Passholder. If you do not have that flexibility in your scheduling you may be better off, not paying the extra money upfront in case plans do not work out. This is not a small amount of money, so take the time to think out your decision before you act. 2 comments to "Is The Disney World Annual Pass A Good Deal?" I am a Florida resident, I have in the past purchased 3-5 day park hopper with no expiration date. The price was from $192-$275, this year I went with a Florida resident weekday select annual pass, cost was $189, I have been to the world four times already, I have benefitted from food discounts as well as reduced room rates. I have saved over $100 already and plan at least 3-5 more trips. Savings will be enormous, the key to the savings is this is the weekday pass, Mon-Fri, I also encounter smaller crowds during the week than I would on the busy weekends. So if you can get away during the week, this is the only way to go!! We have the weekday select as well, we saved $7 through AAA. We have gone 8 times in as many months. We've learned to ONLY stay at nickelodeon hotel. It sleeps 6 people, costs less than disney all stars, and has THREE rooms. Two bedrooms and a living room. A fridge and microwave. We were falling all over each other at the all stars in the ONE little room and disney transportation is dangerous, the buses are often standing room only whereas nick hotel is sit down only with stroller storage underneath instead of trying to stand, hold a baby and a stroller while going to 4 hotels (this happened to me after staying at the windham which also sucked). We've stayed at nick hotel 6 times and have our 7th booked.